With the use of cells in watches, road signs, buoys and on your local rooftops, the future of the PV (photovoltaic) cell seems assured to be in all of our futures. To utilise the 1KW of energy per m2 that lands on top of us would be a solution to most energy problems. While an inventive Nepalese scientist has made a semiconductor from hair, the University of Arkansas has researched copper/ indium /gallium/ selenium combinations, with help from the National Science Foundation who hope to create research and job opportunities within Arkansas. Prof. Omar Manasreh, originally from Bani Naim, is famous within his electrical engineering dept. - officially the Department of Nanoscience and Engineering, for finding funds($8 million in 8 years). NASA and Arkansas have now given him $1 million to help ensure his objective of doubly-efficient PV cells is reached. At the moment, silicon chips give us an efficiency of 23 % (of the energy they take in). The hope from NASA is that 40% can be attained. Using the two advanced techniques he has developed, NASA will trust their satellites will be able to power more devices for longer periods, certainly since they first used PV cells in 1958, in the pioneering Vanguard satellite! First, using his new semiconductor materials, Prof. Manasreh will create films and titanium dioxide and zinc oxide nanotubes using specialised technology he has developed with his team. Secondly, he uses molecular beam epitaxy. 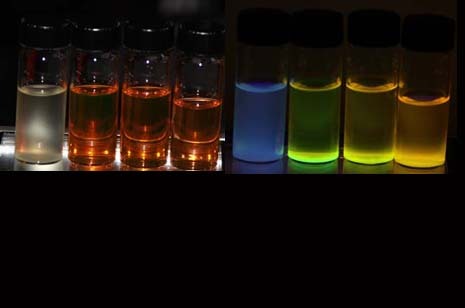 This is the term used to describe the production of Indium arsenide nanocrystals known as quantum dots. Quantum dots are so-called because they are approximately 50 atoms across. Their amazing properties depend however on their small size. They emit photons of wavelengths that differ from larger "dots" so researchers have been able to produce all the wavelengths of light very precisely. Prof. Manasreh and one of his principal colleagues, Dr. Liangmin Zhang, already use this work in several fields such as multicolour detector research. Here, he has used ligands extensively to link metallic particles to his quantum dots as well as the films of nanocrystals in order to investigate the energy output from their various combinations. Instead of photons of light, he investigates plasmons, which are, - guess what - the quantum of charge waves that are generated by photons. How soon will NASA's goals be achieved? It will be difficult to experiment upon all of the potential combinations of nanocrystals and quantum dots, but Prof Manasreh now works in a state-of-the-art laboratory and quotes, "It [the grant] will create new opportunities for further development in the field of novel photovoltaic materials and devices". This is our energetic future. If this international assemblage of talent in Arkansas can improve NASA, then it can surely configure PV cells for more important technologies than the toy factories where they generated light and came to life in the early 50s.